Two 50 somethings dancing, bouncing and romancing on the screen. Salt on scars (jale par namak) is Varun Dhawan's overacting sprinkled with terrible dialogues like- ab meri bhi shaadi hogi, mera bhi honeymoon hoga. What laurels are you bringing to your father's name!? Garnished by Kriti Sanon's blundered extra-innocence, all she had to do was to look beautiful. Ghosshhhh! 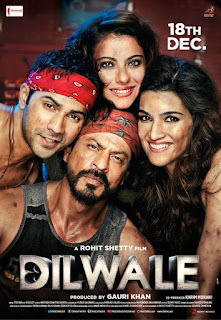 pardon me SRK and Kajol fans, but this movie crossed the limit of my tolerance. 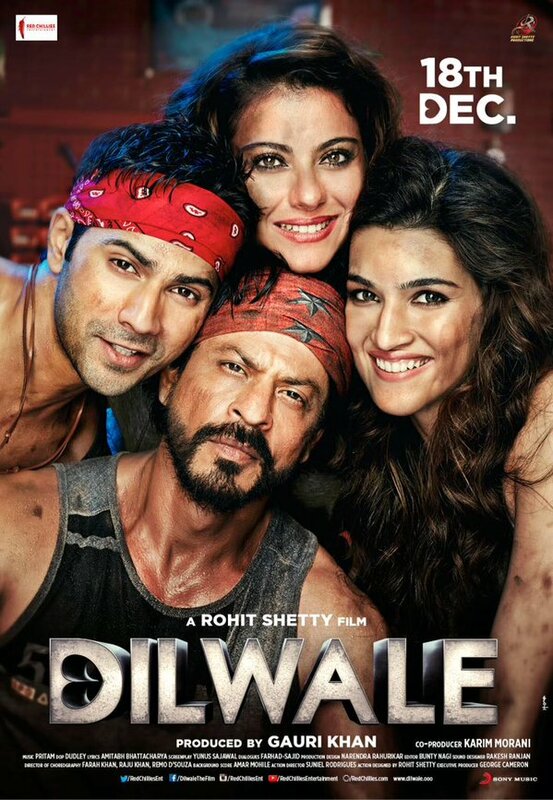 I would repent forever at the moment I decided to watch Dilwale, just because I couldn't get tickets of Bajirao's next n number of shows! Hum sharif kya hue puri duniya hi badmaash ho gayi- Every fifth contact of mine on Whatsapp had set this as status for a week or so, which apparently happens to be SRK's dialogue spoken at an unrelated point of time in the movie. Grandeur of sets, expensive vehicles, overpaid but under-utilized foreign locations, gaudy attires, mediocre plot, nonsensical dialogues, idiotic comedy, a-little-more-than-average music, overacting by every actor, Goa-but-almost-no-beaches- were the only flaws in the movie. Rest of it was hilarious (if anything is left)! Someone go and tell the not-so-old Aunty and Uncle (you-know-who), that they have now aged enough to play the roles of Mom-Dad and must quit romancing on the melodious numbers like Gerua. Paying hundreds of bucks and not even gaining a penny's worth of entertainment turned me furious. I wish I could paste a print out of this post outside every box office in my city and rescue the innocent audience from the torture beforehand. I've heard someone recite- "बचपन में लोग पूछते थे - बड़े हो कर क्या बनना है... जवाब अब मिला- फिर से बच्चा बनना है |"
It's almost the end of the day, to be specific- my birthDAY and by the time I hit "Publish", it would be 19th December. 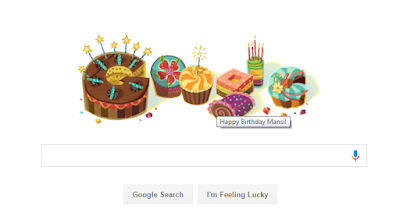 It was a fun filled day, mainly owing to ample of wishes that kept pouring in since 12 midnight! I am ecstatic to have such wonderful folks (family, friends, relatives and colleagues) around. Is your mind buzzing to ask how old did I turn today? Amusingly, my answer is-"an year younger than you..." :) Jokes apart, age is just a number! 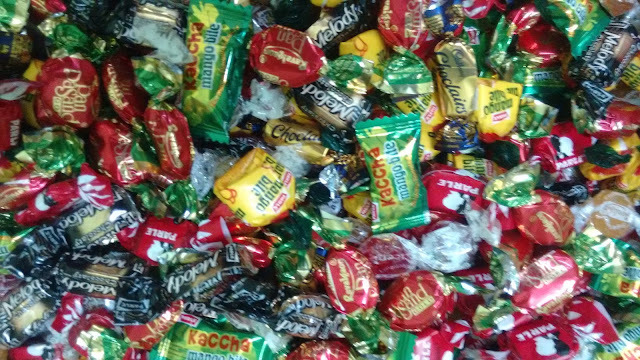 To temporarily transform my two digit age into a single digit age and to rejuvenate the spirit of childhood in people around me I offered toffees to my colleagues at work. To my surprise, it was received well, and all enjoyed relishing the flavors of the simplest childhood memories. ...and the list shall keep flooding. We didn't realize we were building a pile of memories while we were growing up, and that we are still doing that. Upon reading the title, one may assume initially that it is perhaps a compilation of hymns or folklore on Ganesha. Well, not truly. Its far more than that. The author- Devdutt Patnaik is a mythologist. He has written several other books on Hindu mythology focusing on the rational part of it, with a consolidation of all the relevant information. Ganesha is who is one of the most celebrated and beloved gods pan India. About him, not much is known to people, except for stories revolving around how he came into existence, and that he is worshiped before doing anything afresh. In this book, Devdutt Patnaik has penned down an account comprising Ganesha's creation, the rituals associated with him, the literature, symbols, festivals, history, stories, etc.- most of which was not unveiled in so simple manner yet (best to my knowledge). It contains a brief of each of them, leaving the rest to the reader's zeal of exploration. Even after including such vast fountain on information, this book is a precise, concise and quick read. In general, the chapters not inter-related, can be read from anywhere. Every chapter has wonderful illustrations to provide a better insight into the respective section. 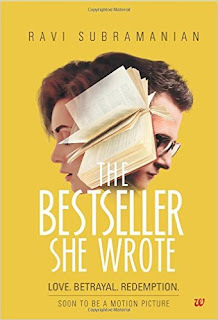 Regarding the text- it contains simple vocabulary, meticulously articulated, suited to the contemporary generation who escape from reading huge epics or upanishads. The best part is that it doesn't aim at cultivating superstition, but seems to based on the available documentation and author's interpretation. My only apprehension is that, unlike fiction based novels, the reader might not be able to retain and recall all this by reading only once. I rate it 4 on 5 stars. 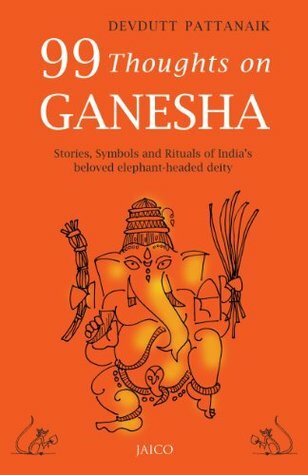 For those who are looking for enlightenment on mythology and are curious about Ganesha, must read this book. You cannot judge a fish by its ability to fly!